My goodness! 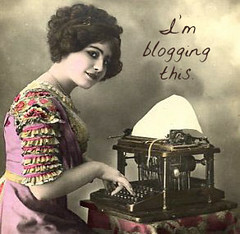 There is so much excellent blogging happening by the classes and students taking part in this challenge. Remember, if you want me to visit your blog to read your posts, you need to leave a link somewhere in your post linking back to the student blogging challenge blog. « Couldn’t see the video last week? Hey Mrs. W I don’t think you remember remember me But, I was the one that you told not to put my last name. I just got a mac and I love your blog so much. I notice you still have your whole name when leaving a comment. Remember first names only even in your profile. by baconboy one of the studnts YEAH!!! Wow, there is just so much good material out there. Thank you Miss.W for the inspiration and connections. We have joined late, but we are trying very hard to get caught up with everyone else. My students are LOVING this. Please check us out and let us know what you think. Keep up the great work and visit us ! It’s almost summer here in NZ ! Miss W, this is WONDERFUL stuff! My head is spinning as I try to get to all of these. So many outstanding examples of the power of student blogging. Thank you so much for all your hard work organizing the challenge. We are having so much fun!